So last week I was ready for a road trip. Got my wallet. Got my phone. Where’s my keys? I lost my keys! If this is a common scenario in your home, you are not alone. I do this at least once a week. Unfortunately this time, the keys were really lost. Looked all over for them. This is now a major search mission. Looked all over the house twice and finally uncovered them between the cushions of the couch. I honestly don’t remember taking them to the couch, but that’s where they were. I have no plans to do that again and off I went to find some technology to save the day next time I lose my keys. After searching the internet, I found that there are two basic technologies that can be used to find your keys (or anything else that you can stick a small token to). While the primary audience for what I’m about to describe are people with key chains, some kits come with small adhesive disks to permit adhesion to almost anything. These receivers (or tokens) are typically the size of a quarter and they are powered with a small round lithium battery similar to one used in a watch or garage door opener. The low tech and least expensive key finder operates using wireless radio frequencies. It’s the same technology that used for most television remotes. There are two parts to this type of kit. A transmitter which looks like a small TV remote and a series of receivers that you can place on your key ring. Both are powered with included lithium batteries. 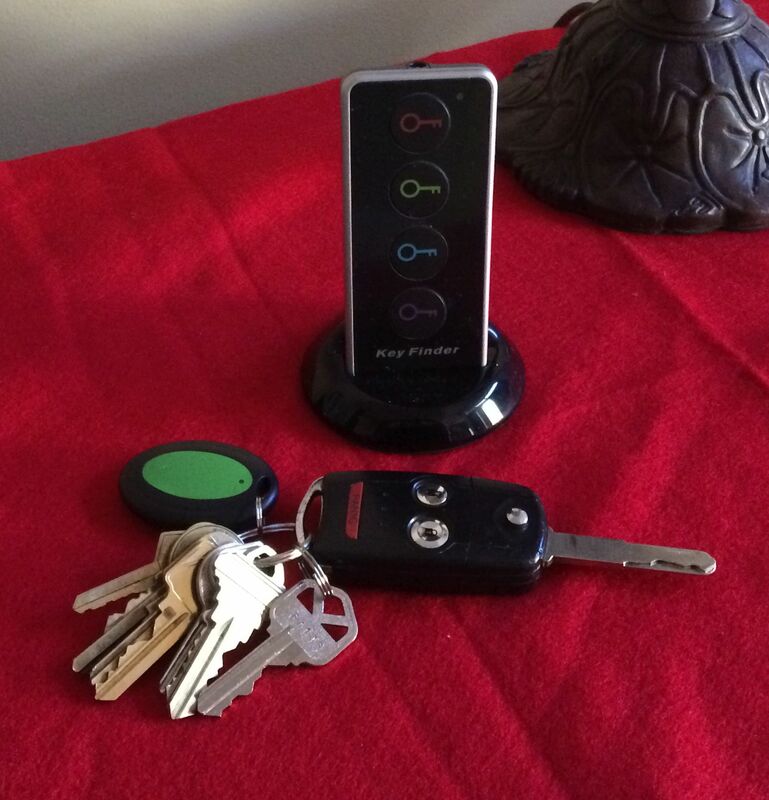 The JTD Wireless Key Finder comes with the remote and three receivers. This is the brand that I wound up purchasing myself. I now have all my key chains with one of these attached and I tested the effective distance of the transmitter. It went across my home with no issue. The transmitter has buttons on it each with a different color corresponding to the receiver color. Press the green button and my keys now give off a chirp. Even under the couch cushion. I keep the transmitter on one of the shelves in my living room. Can’t wait to use it for real. We can do almost anything from our phones these days, so I figured there must be a way to do this from my iPhone. I was right. The Tile Key Finder is the high tech way of finding your keys. The Tile uses Bluetooth for connectivity and this offers some features that RF finders don’t have. The transmitter / receiver relationship goes both ways so if you misplace your phone, press the tile on your key chain and your phone makes a sound. There is a smartphone app for Android and IOS. You can enter the receiver and correlate it to the items they are attached to which means you can attach a name like “Acura Keys” to the name of the receiver within the app. When you misplace your keys, find your phone, open the app and sound the alarm. So why did I go with the RF model instead of the Bluetooth? Connectivity and cost. My experience is that Bluetooth begins to get unreliable beyond about 30-40 feet where RF goes around walls without a problem. Additionally, the RF models go for less than half the price of the Tile. Both will work well, but if your primary purpose is to find your keys, then (in my opinion) the JTD Wireless Key Finder is the better solution.